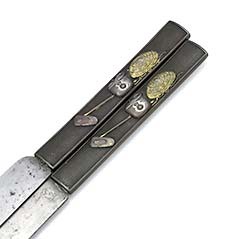 Two Japanese knives from the Meiji period with Kozuka handles in bronze with Japanese motifs. Each knife is 8 1/4" long. Handles are in good condition; blades have wear. A Gorham ladle with exceptionally fine piercing and a hammered surface. The handle has an applied copper cherry branch. The bowl is gold washed. Length 7". Weight 2.4 toz. 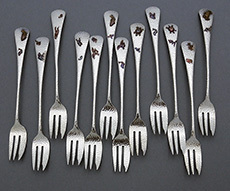 A set of twelve Gorham antique sterling silver cocktail forks with applied copper Japanese motifs including sea creatures and birds. All mixed metal applications on a completely spot hammered surface. Length 6". Weight 8.55 toz. 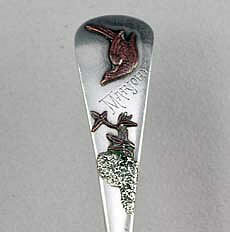 A Whiting antique sterling silver hammered cheese scoop with applied copper cherry branches. Monogrammed. Length 8". Weight 2.2 toz. A Shiebler antique sterling and mixed metals ice cream slice with the blade in a leaf form and a copper bug on the textured leaf terminal. Circa 1880. Length 10". Weight 3.2 toz. 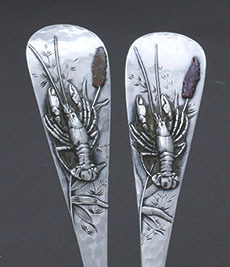 An antique sterling and mixed metals long handle salad serving set by the Whiting company with applied silver and copper lobsters with engraved highlights. 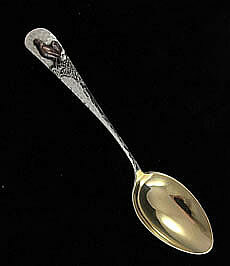 There is an engraved Japanese style monogram on the reverse of the handles. Length 12". Weight 10.25 toz. Gold washed bowls and tines. Hand hammered surfaces. Eleven of the finest Gorham knives with sterling blades and Japanese kodzuko handles. 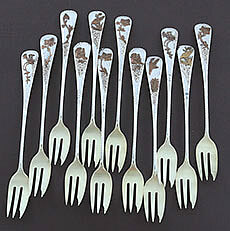 In particular the handles are of the very finest quality with interesting Japanese style matching monograms. 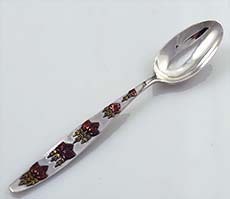 The engraved sterling blades vary in form but the set started out life together. The Gold on the handles is in pristine condition. 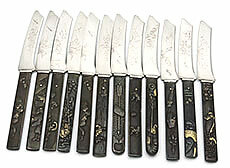 Length 7 7/8"
Twelve Gorham number 5 antique sterling knives with bronze kodzuko handles highlighted with gold leaf. 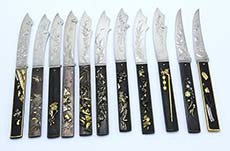 The sterling blades are hand engraved with Japanese style engraving and have a satin finish. 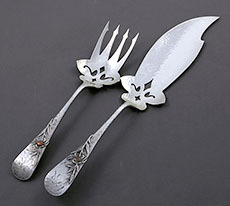 A set of twelve pristine antique sterling and mixed metals Gorham cocktail forks with applied copper and silver Japanese motifs on a hand hammered handle. The back of the handles are satin finished and monogrammed and the tines are gold washed and satin finished. Marked lion, anchor, G, sterling & other metals. Length 5 7/8". 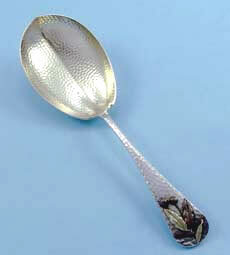 A Whiting hammered mixed metals serving spoon with applied copper and sterling acorn on the handle. Length 8 1/2"; weight 3.75 troy oz. Good condition and never monogrammed. 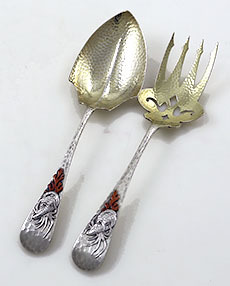 A Whiting sterling and mixed metals hammered fish serving set with Japanese style monogram on the handle and applied copper crabs. Hand engraved detail between the applications. 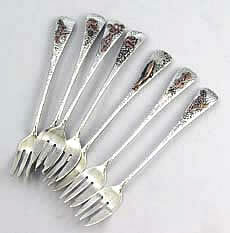 A Whiting antique sterling hammered salad serving set with applied oyster shells and copper seaweed on the handle. Never monogrammed. 6.35 troy ounces. Length 9 1/4". 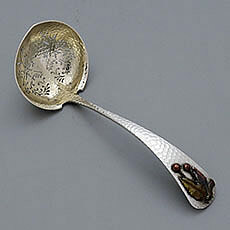 An antique sterling hammered macaroni server with applied plant with copper leaves. Monogrammed on the fromt of the handle. 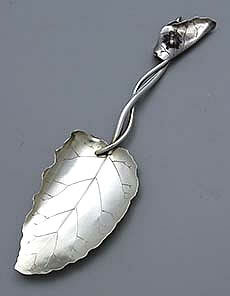 Engraved detail between the applied leaves and the mixed metals application. Length 9". Weight 4.2 troy ounces. 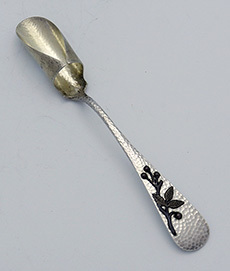 A 6 inch long antique strerling tea spoon marked Tiffany and Company circa 1880 with applied mixed metals decoration on the handle. Monogrammed on the reverse of the handle. 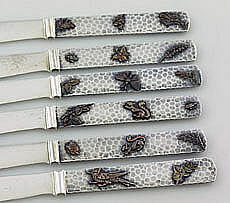 A rare set of six knives with hand hammered handles containing copper applications of bugs and other Japanese motifs on both sides. Circa 1880. The blades are all silver and are marked with the logo and the Dominick and Haff mark. Length: 7 7/8" . Combined weight: 11.4 troy ounces.